Summer calls for fun. And nothing means fun quite like a bright Hawaiian shirt. As summer approaches, people think about getaways, vacations and new experiences. They want to explore. They want adventure. They want to seek out wonderful surprises, hidden secrets and to create heartwarming memories. Your restaurant can be part of their journey. 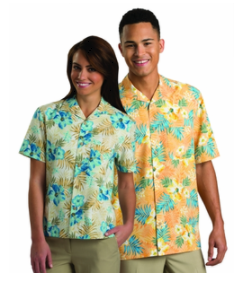 Your waitstaff can share in that summer fun with our Tropical Hibiscus Camp Shirts. Available in a variety of colors, these vivid Hawaiian shirts bring out lively personalities and brilliant smiles. It’s hard to be in a bad mood when employees are surrounded by such cheery patterns. Each pattern features the hibiscus flower, the state flower of Hawaii. The unique shapes of its petals and stamen are instantly recognized symbols of tropical treasures. Cultures around the world cherish the flower’s beauty, making it the perfect symbol for the new experiences your customers will share at your tables. The color combinations are perfectly toned to make logo embroidery stand out for a professional look. Each shirt has a full cut chest pocket on the left, and side vents at the hem, so if the summer brings too much heat, your staff will still feel a cool breeze. Each shirt is cut in a unisex, camp style with a notched collar — just like a classic Hawaiian shirt, saving you the stress of ordering shirts across genders as well as sizes. Fabric: 100% Polyester, 3.5/3/75 oz. For more than 16 years, Averill’s Sharper Uniforms has offered the highest-quality wardrobe for restaurant and service employees. We know how important it is for uniforms to be comfortable, functional and durable — even when that uniform is a simple Hawaiian shirt. No matter where your restaurant is, these shirts will help turn your restaurant into a tropical paradise filled with summer fun, and help you make the most out of your customers’ adventures. ← New Spring products from Down Under!